Meanwhile, research devoted to exploring bizarre quantum phenomena must continue to overcome or reduce a litany of practical obstacles before quantum computing can be realized. Not the least of these obstacles remains the isolation of qubits---the repository of quantum information---from their surroundings. A qubit, or better yet an ensemble of qubits, exists in a superposition of two or more possible states. The trouble is that superposition is a fragile condition, and the manipulation and final readout of those states are in danger of being undone if a qubit interacts with its environment. A new paper, published in Nature Physics ("Environment-assisted quantum control of a solid-state spin via coherent dark states") addresses this problem by demonstrating a new type of qubit control, one that actually makes productive use of a qubit's proximity to its surroundings. The experimental work was performed at the Cavendish Laboratory at Cambridge University in the UK. Joint Quantum Institute (JQI) scientist Jacob Taylor provided the theoretical input to the work over the course of five years of cross-Atlantic collaboration. Qubits come in many forms but have one essential thing in common: they all embody a physical system---whether in the form of a photon or atom or electron or electrical current---which exists in two quantum states simultaneously. In the Cambridge experiment the qubit is a single electron trapped in a semiconductor. 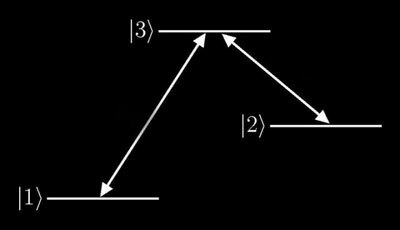 The two quantum states, in this case, consist of the two orientations for the electron's tiny spin, either up or down. The electron's trap is a tiny region of the semiconductor called a quantum dot, essentially a zero-dimensional volume housing a single active electron. When studied at a temperature of about 4 K, the electron spreads as a wave across the 10 nanometer length of the quantum dot. The dot can be considered to be an artificial atom in which the electron (instead of orbiting a single nucleus) is confined in the crystalline lattice of millions of atoms. And like electrons in regular atoms, the select electron in a quantum dot possesses an energy spectrum of discrete energies. The dot is fabricated using existing nanotechology. In substance it is a tiny lump of indium arsenide (InAs) grown amidst surrounding thicker layers of gallium arsenide (GaAs). Recall the story of the princess and the pea; a girl confirms her status as a princess by detecting a very faint lumpiness created by the presence of a single pea sandwiched between much larger mattresses. Here the pea is the InAs quantum dot and the mattresses are the GaAs layers. The two species of semiconductor blend, InAs and GaAs, are incommensurate, meaning that their natural atomic spacings are slightly different. In practice this ensures that the atoms in the InAs dot are under some stress amid the surrounding GaAs atom layers. This stress, in turn, leads to the growth of such small 'pea'-like dots, confining the electron inside. Fortunately, one can probe the properties of these buried quantum dots via light, as the materials are transparent, allowing experimentalists to control and manipulate the electron using lasers. The electron's energy spectrum is made still more complicated by the faint magnetic interaction between it and the nuclei of all those indium and arsenic atoms. Each of those nuclei has a net magnetic field and behaves as if it were a tiny magnet. Those nuclei, in the absence of an external magnetic field, are pointing in all different directions. But at any one moment, the totality of the nuclei exert a single, effective field, which the electron senses. 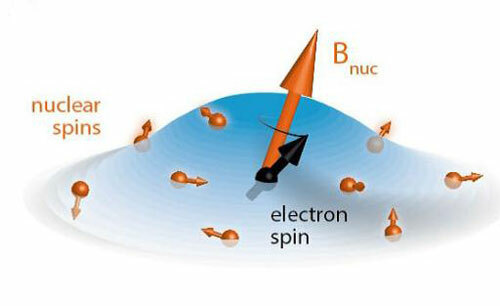 The collective nuclei form a magnetic "environment" for the electron. In just a moment we'll see how the electron is employed as a qubit and how its environment---usually viewed as a threat to maintaining the quantum integrity of the qubit---is actually put to use in the process of manipulating and reading out the qubit. If a laser strikes the quantum dot at certain wavelengths corresponding to allowed electron energies, the dot will absorb and then reemit light. It will fluoresce. Things get more interesting, however, if the electron can be coaxed into not absorbing light. To do this a dark state must be created. Generally, if a laser beam is tuned to the energy difference between two quantum levels, the atom can absorb laser light and be promoted to the more excited of the two states. The continued presence of the laser light will later stimulate the atom to re-emit the light and return to its lower (ground) state. In some circumstances this absorption/emission process can be stymied if there are closely spaced ground states. Two laser beams, one tuned to promote the atom from state 1 to state 3 and one tuned to promote the atom from state 2 to state 3, can interfere with each other, leaving state 3 unreachable. This destructive interference can be turned on and off by changing the relative phase of the two laser beams. This method is employed in the Cambridge experiment. The quantum dot qubit consists of the lone electron being maintained in a state of superposition (spin up and spin down) by laser light. Moreover, the presence of the underlying nuclear magnetic field forming the electron's "environment" helps establish a two-part ground state. Thereafter, the combination of the environment, plus the presence of two carefully-tuned laser beams allows the state of the qubit to be controlled (swiveled around in space) and even to be read out when detectors glimpse the electron as a bright (fluorescent) or a dark object. In quantum computing, the explicit state of the qubit is unknown (spin up or spin down); this is positively a necessary condition---a required indeterminacy---for the quantum computation to continue. The only thing required is that one knows the relative change in the qubit, such as whether it was swiveled through an angle of 90 or 180 degrees. In conventional computing an example would be a NOT gate, which changes a bit from a 1 state into a 0 state or vice versa. It's only important to know the relative change in the bit, not its actual value. "What is profound is that the electron spin is always in the same quantum superposition, but the physical state evolves with the nuclear field," notes Mete Atature, the Cambridge researcher leading the experimental study. "Usually you need an external magnetic field to manipulate qubits," says Jacob Taylor, "but this single field can't be used also to read out the final state of a qubit. In our all-optical approach we don't use a field so we can perform manipulation and readout with a single setup."